There are several fundamental problems in the global economy, legacies of the past 20 years - from the mid 1990s on - that continue to drive the trend toward secular stagnations (see explainer here). One key structural problem is that of excessive reliance on credit (or debt) to drive growth. We have seen the devastating effects of the rapidly rising unsustainable levels of the real economic debt (debt that combines government obligations, non-financial corporate debt and household debt) in the case of the 2008 crisis. And we were supposed to have learned the lesson. Supposed to have, because the entire conversation about structural reforms in banking and capital markets worldwide was framed in the context of deleveraging (reduction of debt levels). This has been the leitmotif of structural policy reforms in Europe, the U.S., in Australia and in China, and elsewhere, including at the level of the EU and the IMF. Supposed to have, because we did not learn that lesson. 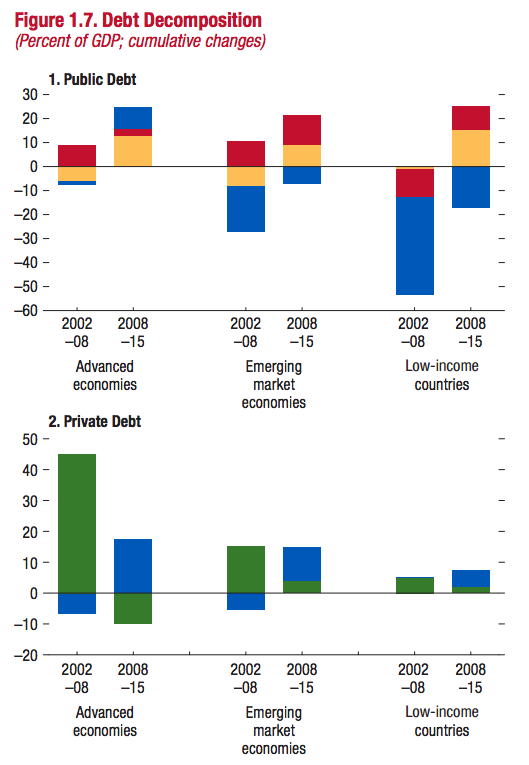 Instead of deleveraging, we got re-leveraging of economies - companies, households and governments. Take the U.S. corporate bonds market (that excludes direct loans through private lenders and intermediated loans through banks) - an USD 8 trillion-sized elephant. Based on the latest research of the U.S. Treasury Department, non-banking institutions - plain vanilla investment funds, pension funds, mom-and-pop insurance companies, etc. - are now holding a full 1/4 of U.S. corporates bonds. According to the U.S. Treasury, these expanding holdings of/risk exposures to corporate debt are now "a top threat to stability" of the U.S. financial system. And the warning comes at the time when U.S. corporate debt is at an all-time high as a share of GDP, based on the figures from the Office of Financial Research. And it gets worse. Since 2007, corporate debt pile in the U.S. rose some 75 percent to USD 8.4 trillion, based on data from the Securities Industry and Financial Markets Association - which is more than USD 8 trillion estimated by the Treasury. These are long-term debt instruments. Short-term debt obligations - money market instruments - add another USD 2.9 trillion, and factoring in the rise of the value of the dollar since the Fed meeting this week, closer to USD 3 trillion. So the total U.S. corporate debt pile currently stands at around USD 11.3 trillion to USD 11.4 trillion. Debt held by systemic retail investment institutions (insurance companies, pensions funds, retail investment funds) is at all-time high. And the risks in this market are rising. Since the election of Donald Trump, global debt markets lost some USD 2.3 trillion worth of value. This reaction was driven by the expectation that his economic policies, especially his promise of a large scale infrastructure investment stimulus, will trigger inflationary pressures in the U.S. economy that is already running at full growth capacity (see here). Further monetary policy tightening in the U.S. - as signaled by the Fed this week (see here) will take these valuations down even further. Some estimates (see here) suggest that the Republican party corporate tax reforms (that might remove interest rate tax deductibility for companies) can trigger a 30 percent drop in investment grade bonds valuations in the U.S. - bonds amounting to just under USD 4.9 trillion. The impact would be even more pronounced on other bonds values. Even making the estimate less dramatic and expecting a 25 percent drop across the entire debt market would wipe out some USD 2.85 trillion off the balance sheets of bond-holding investors. As yields rise and bond prices drop, the aforementioned systemic retail investment institutions will be nursing massive losses on their investment books. If they rush to sell their bond holdings, they will crash the entire market, triggering potentially a worse financial meltdown than the one witnessed in 2008. If they sit on their holdings, they will be pressed to raise capital and their redemptions will be stressed. It's either a rock or a hard place. The glut of U.S. corporate debt, however, is just the tip of an iceberg. 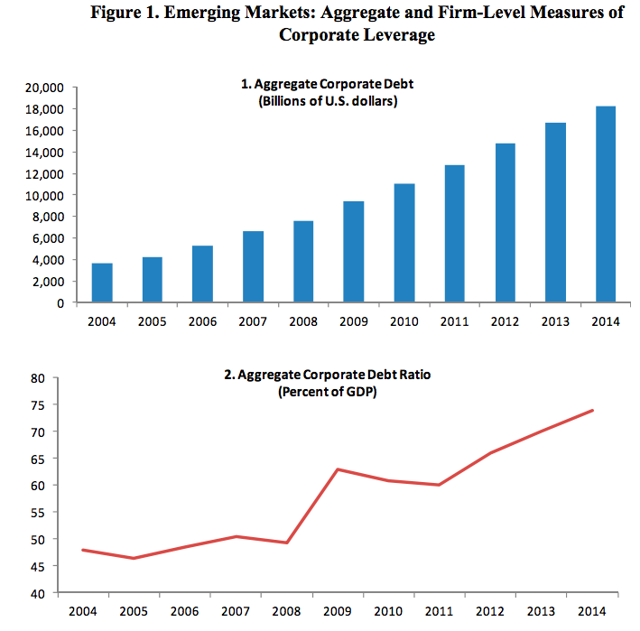 As noted in this IMF paper, published on December 15th, corporate leverage (debt) has been on a steady march upward in the emerging markets. Yes, global real economic debt now stands at around USD 152 trillion or 225 percent of world GDP. 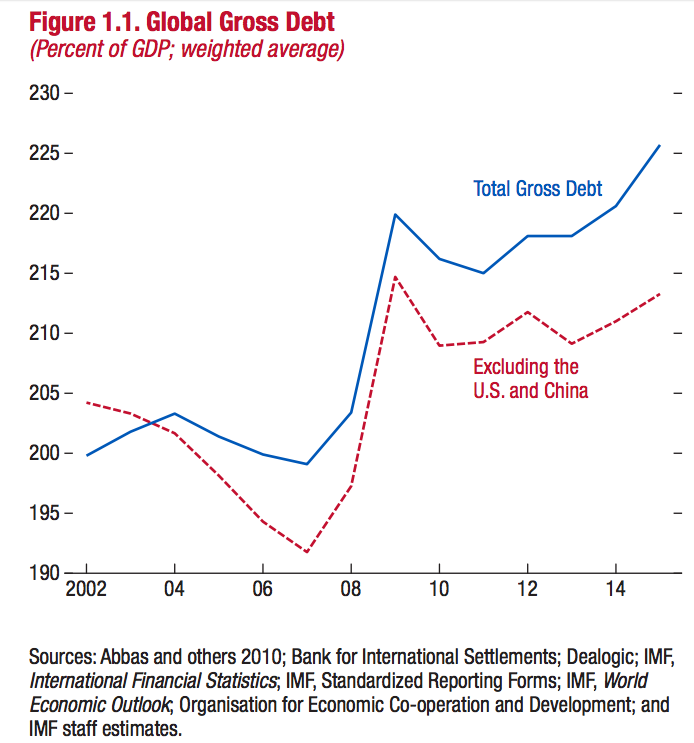 Excluding China and the U.S., global debt levels as percentage of GDP are close to 2009 all-time peak. 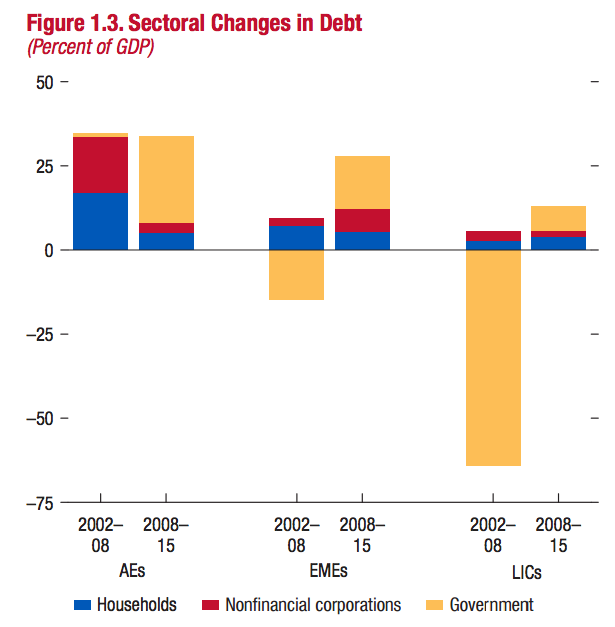 Much of the post-Crisis re-leveraging took place on government's balance sheets, as illustrated below, but the most ominous side of the debt growth equation is that private sector worldwide did not sustain any deleveraging between 2008 and 2015. In fact, advanced economies government debt take up fully replaced private sector debt growth rates contraction. So all the fabled deleveraging in the economies in the wake of the Global Financial Crisis has been banks-balance sheets deleveraging - Western banks dumping liabilities to be picked up by someone else (vulture funds, investors, other banks, the aforementioned systemic retail investment institutions, etc.). 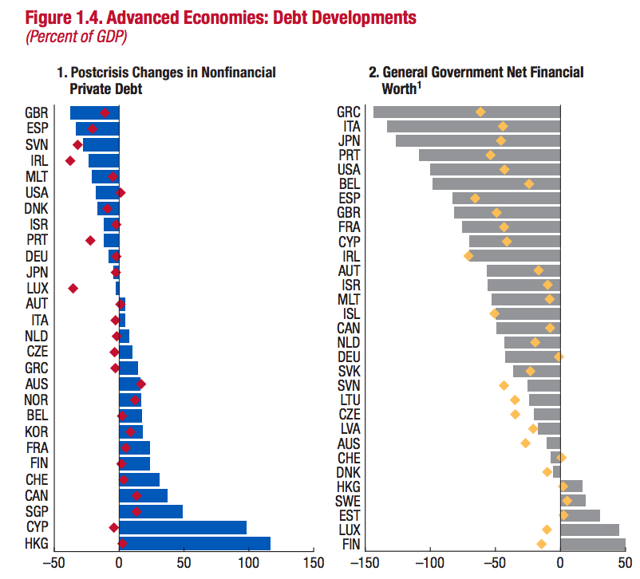 In simple terms, across the advanced economies, there was no spending austerity. There was tax austerity. And on the effectiveness of the latter compared to the former, you can read this note. Spoiler alert: tax-based austerity is a worse disaster than spending-based austerity. In summary, thus, years of monetarist activism spurring a massive rise in corporate debt, coupled with the utter inability of the states to cut back on public spending and the depth of the Global Financial Crisis and the Great Recession have combined to propel global debt levels past the pre-crisis peak to a new historical high. The core root of the 2007-2010 crisis is back. With a vengeance.